Friday night I started by doing some of this…. ….and by Saturday I had this finished……. ….I even love it from the back!!! then I worked on a little birdie alphabet for my alphabet sampler BOM designed by the most wonderful Fee of Designs by Fee…. You can read more about it HERE and even purchase your own copy….I’d recommend it….it’s just too cute for words!!! And today has been catch-up day……. working on some borders for my Long Time Ago in Bethlehem quilt…..it felt lonely being left behind so has been calling me to finish it!!!!! I think it’s about time, don’t you!? So my FNSI lasted ALL weekend!!! 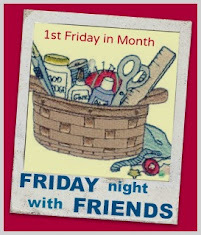 I’m off to see what everyone else got up to at FNSI….care to join me??? Your quilt top looks great Wendy, well done! And a great Friday night - thank you. You accomplished a lot over the last few day, well done! :) Barb. A very busy girl! Your A4A is great. You have been so busy!! Love your quilt! Love those type of weekends, you were very productive! Much accomplished Wendy. They all look great! Great job on Fee's birdies...aren't they just adorable. I finally got my photos up so now I'm off on the visiting trail. Thanks for hosting again!